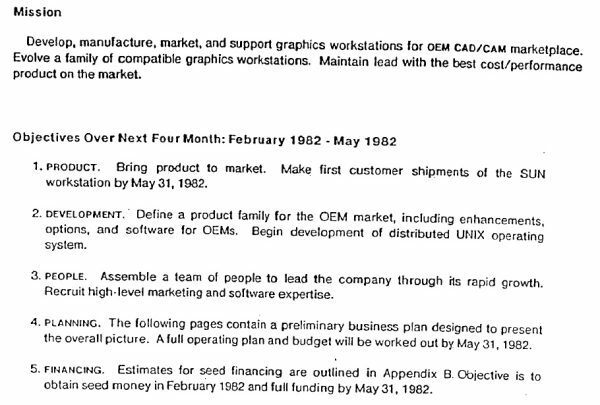 Classic business plan: Sun Microsystems—the first few words say it all. Business Plan Outline: This is a business plan outline of a business plan that is less than 20 pages, plus appendices. Naturally you are going to make it specific to your situation. You will adapt it according to the purpose of your plan. Your business plan may be to serve as evidence of why the bank should give you a loan. Maybe it is going to be the document to serve as a means of persuading someone to become your co-founder. On the other hand the business plan outline may just be a tool to help you ensure that you have covered all the bases. The business plan outline below does cover all the bases, but you should not slavishly set yours out exactly in the chapters below. There are people who can produce a convincing document on the back of a napkin. Maybe you are one of those. Appendices—all the detail and data (especially financials for three years—first year monthly, thereafter quarterly: income statements, balance sheets & cash flow forecasts); a ‘subject background’ to the opportunity, sales forecast breakdowns, or technical details can be added. Do not forget cover page with contact details (do not forget email and phone) + confidentiality/copyright (but do not ever ask for a non-disclosure agreement from a VC—you will never get one) and a Table of Contents. Each point in your executive summary should show a link to the appropriate section of the main plan. The business plan outline makes it look like an awful lot of work to actually write it. Yes, it is. However, as long as these issues are all covered, you will probably thought of everything. Yours is a special case and will prove the exception to the model I have offered. You may have a technology that needs description and the patents listing; the disruption you are going to cause may require an exposé of the present situation; you are exporting/importing and the conditions may not be obvious. and Business Plan Mistakes and How to Avoid Them.